Bangkok is my favorite city in the world, I wouldn’t have spent 5 years living there otherwise. You’re probably thinking, why the hell would you spend that long in Bangkok? Let me tell you, there are so many amazing things to do in Bangkok that it’s impossible to get bored. You could easily spend two weeks here and not see it all. If you are planning to travel to Bangkok, then you should consider my Bangkok Travel Guide which contains over 50 destinations in and around the city. There are over 300 temples in Bangkok, that’s almost one for every day of the year. You can comfortably visit up 4 temples in one day, that will take you 6 hours or more without rushing it. I wrote a detailed article on 12 temples in Bangkok worth visiting. This includes the popular Wat Pho and Wat Arun, but also some lesser known temples like Wat Benjamophit and Wat Bowon Niwet. There’s a map included so that you can easily plan your trip around town. 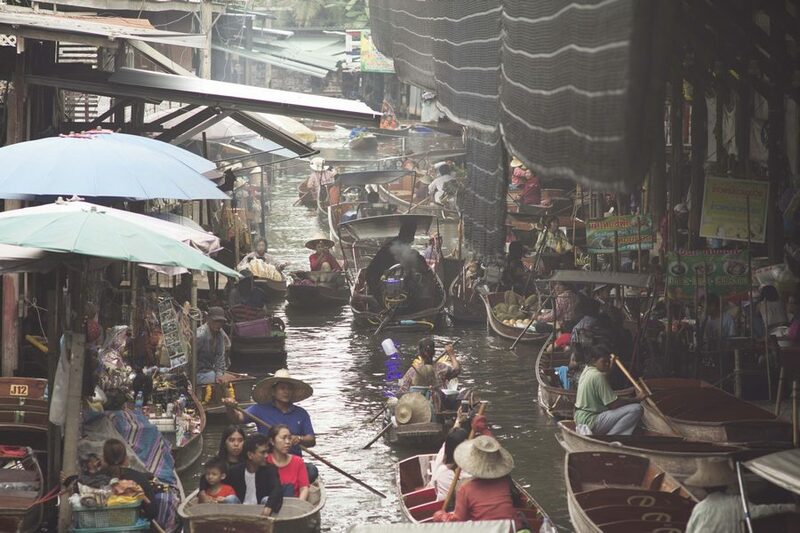 Exploring a floating market must be on your list of things to do in Bangkok. Floating markets are the pinnacle of Bangkok’s culture all compressed into a dense little area. You will amazing foods served out of small shops, crammed around the canals. The canals are teeming with little wooden boats offering fresh fruit, grilled seafood, or operating as tour boats. There are a few floating markets just outside of Bangkok such as Damnoen Saduak, and Amphawa, but you don’t need to travel that far. In Bangkok’s Taling Chang district you will find Khlong Lat Mayom Floating Market which is the most authentic market. For more info, I’ve written a full review of the market and the boat trip I took around the community. The “Tuk Tuk Mafia” as they are locally known. Sure, the fares are hugely variable, and quite often overpriced for tourists, but have you really experienced Bangkok without riding in the back of a tuk-tuk? There is something so fascinating about hopping in a tuk-tuk in Bangkok’s Old Quarter. You get to see so much more of the surrounding area than if in a taxi. I suggest taking a tuk-tuk out of the peak hours, as traffic jams make for a hot and sticky ride. Expect to pay about 100 THB for a 2-kilometer tuk-tuk ride. There are so many massage shops all around Bangkok to get you completely mellowed out. After one hour, your feet will feel like they are walking on clouds. You could be a complete tourist and get a massage on Khao Sarn Road, but there is much better value around. For the best foot massage, head over to Onnut BTS Station. Take a short walk to Sukhumvit Soi 77/1 where you will find Takrai Hom (English translation means lemongrass). A one-hour foot massage is just 200 THB. For the best results, put your phone away and forget about the outside world. If you’ve never watched the sunset from a level 50 rooftop bar with a half-price cocktail in hand, then I have your next destination covered. Visiting up a rooftop bar in the early afternoon is one of my favorite things to do in Bangkok, as long as it’s not raining. There are a few great rooftop bars around Bangkok such as Banyan Tree in Sala Daeng, Cielo in Phrakanong, or Long Table in Asoke. However, my favorite bar with great value (yes, 2-for-1 happy hour) is Octave in Thong Lor. With its largely expat crowd, it’s a little bit classy, but not richly pretentious. For more of a party vibe, you can also visit Above Eleven in Nana. Fresh markets are also commonly known as wet markets. They are a hive of authentic, non-touristy, activity. Fresh markets are a place where locals come to buy fresh meat, fish, fruit, spices, etc. It is essentially a decentralized supermarket, owned by locals, used by locals. The best time to visit a fresh market is early in the morning. There will be lots of people buying their goods, and the food court will be busy, smashing out fresh plates of tasty Thai foods. It’s one of the cheapest places to eat in Bangkok, with a typical rice dish costing 40 to 50 THB (USD 1.50). Here’s a short video I made in my local fresh market in Onnut. It’ll give you an idea of what to expect. The best food in Bangkok is street food. There’s so much of it around that you’d be crazy not to try it. Sure, there’s the thought of getting sick, but hygiene in Bangkok is actually a lot better than many other places around Southeast Asia. One of the most popular street food areas is Chinatown (locally known as Yarowat). There are hundreds of street food vendors lining the streets. You will also find small pockets of street food throughout the suburbs in lower Sukhumvit like Phrakonong and Onnut. There isn’t much street food available in the city center. Some of my favorite street food dishes are; somtam (papaya salad), pork larb (spicy minced pork), and pad thai. I bet you had no idea there were islands in Bangkok. These islands obviously aren’t like the ones you will find in the south of Thailand with nice beaches and clear water. Bangkok’s islands are located in the Chao Praya River with little villages on them. Bang Krachao (also known as the Lung of Bangkok) is located right in the middle of the city. There is a small floating market, lots of small farms, and a huge wetland park on the island. My detailed guide on Bang Krachao gives more details on how to get there. Koh Kret is actually located just north of Bangkok, it takes about 45 minutes to get here. The island has a historic pottery village, where the locals still handcraft goods today. There is also great little microbrewery on the island. 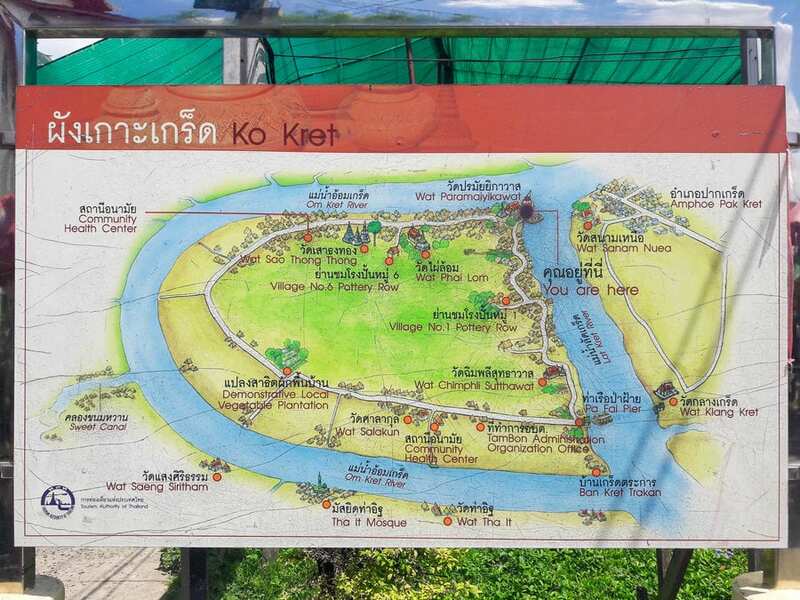 Check out my detailed guide on Koh Kret here. There is a district in Bangkok with lots of amazing street art, most people just don’t know about it. The large wall murals are down a series of small alleyways tucked in between the Chao Praya River and Charoen Krung Road. The best way of exploring is on foot. Walk from Saphan Taksin BTS Station up along Charoen Krung Road. Some specific alleys with street art include; Charoen Krung Soi 28, 30, and 32. Visiting a park is one of the simplest yet most relaxing things to do in Bangkok. Once you lay back on the grass between the trees you can completely forget about the madness of the city outside. There are some huge parks in Bangkok, so you can really escape the chaotic traffic and crowds of people. Chatujak Park is probably the easiest to visit, it is walking distance from the Chatujak weekend market. Hire a bicycle here for just 50 THB and cycle a few laps around the park. There is an interesting butterfly arboretum worth visiting too. Sri Nakhon Khuean Khan Park is by far the best in Bangkok. This huge wetland park is located on Bang Krachao island. When you enter, it feels like you are stepping into another world. You’ll just have to visit to experience it. The vibe at a night market is so different than the weekend or floating markets. Night markets have lots of small food stores, some clothes shopping, and a large section of bars with live music. 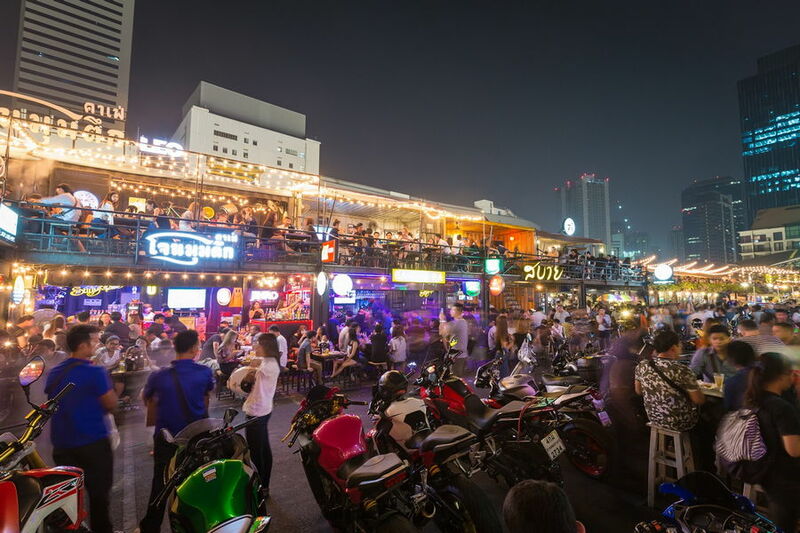 It’s really the best place to party like a local in Bangkok. There are three major night markets in Bangkok worth visiting. Rot Fai Srinakarin is the largest with the most local vibe. Rot Fai Ratchada is easier to reach being right next to the MRT station. Chatujak JJ Market has the most foreigners as it is close to the popular weekend market. Got any questions on these things to do in Bangkok? Leave me a comment below and I’ll try to get back to you within 2 days!